Everyone’s familiar with these phrases that have been strung across the media lately. Issues surrounding police incidents and racial profiling have been all over the news since the Ferguson shooting in 2014 and things are only getting worse. As tensions increase between law enforcement and the public, states are in a scramble to balance the issues. North Carolina Governor Pat McCory has signed a bill into law that will no doubt ruffle some feathers. Under House Bill 972, police body camera footage will not be considered a matter of public record. North Carolina isn’t alone, at least 30 states are considering some form of legislation that would limit public access to footage. So, why is this such a problem? Lack of accessibility to body cam footage could mean, to some, a lack of police accountability. No accountability means no incentive to improve behavior. With open access laws to public records, HB 972’s exclusion of body camera footage as a public record presents a problem. Looks to me that body cam footage would be inclusive. Even though it’s broadly written, there’s little room left to argue that body cam footage shouldn’t be considered public record—body cam footage made while an officer is on duty is, by definition, a public record. whether confidentiality is necessary to protect an active or inactive criminal investigation or potential investigation. Accountability is obviously the biggest reason why supporters say body camera footage should be public record and, by definition, they’re not wrong. Transparency offers that accountability the public wants—if the officers know they’re being recorded then they’re less likely to deviate from protocols. Not only do they offer accountability, but many argue exposing the footage to the community will open the eyes of the many that don’t understand the tough decisions police officers have to face on an everyday basis and, thus, only improving the relationship between civilians and police. On the flip side, privacy reasons are of number one concern. 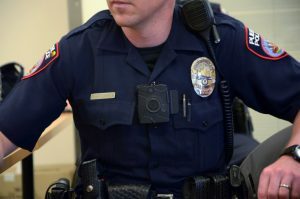 Body cams raise more issues than dash-cams because there’s the possibility of recording inside private residences or other places where individuals have an expectation of privacy. Anyone see a 4th Amendment unreasonable search and seizure issue here? Allowing access quickly is definitely important in cases where police misconduct is alleged, not just for the individual involved, but for the safety of police officers and the surrounding community as well. However, because of the constitutional issues surrounding body camera footage there definitely needs to be a balance between the public’s right to the information with an individual’s right to privacy, especially when you have a hot button issue like police brutality and racial profiling as a factor. Body cam footage can often times record people at their worst and, despite a need for police accountability, footage shouldn’t be released to just anyone. Who wants their drunken arrest or private information blasted all over the internet by some blogger? Most would say no thank you. Just as any other public record, footage would be subject to certain exemptions and North Carolina’s law is no different—implementing an extra law limiting the access even further seems unnecessary. I’m all for legislation implementing a process for which interested parties can gain access to footage, but it shouldn’t be difficult to nearly impossible to do so either. « Will Clinton’s Email Controversy Benefit Whistleblowers?